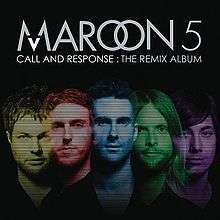 Call and Response: The Remix Album is a remix album by Maroon 5, released on December 9, 2008. It features remixes of songs from the group's first two studio albums, Songs About Jane and It Won't Be Soon Before Long, by various artists and producers. The remix of the song "Not Falling Apart" peaked at number 3 on the Billboard Hot Dance Club Play chart. Giving the album a B+, Entertainment Weekly said that "The L.A. quintet makes it work on Call and Response: The Remix Album, letting those unusual suspects--along with hitmakers like Mark Ronson and Pharrell Williams--play with their master tapes." The album debuted on the Billboard 200 at number 73. ↑ Rosen, Jody (2008-12-11). "Maroon 5 Call and Response: The Remix Album Album Review". Rolling Stone. Retrieved 2015-09-19. ↑ "Club Music, Hot Dance Songs, Club Songs, Dance Club Music Charts". Billboard.com. 2012-02-04. Retrieved 2012-02-09. ↑ "Entertainment Weekly review". December 3, 2008. 1 2 "Maroon 5 – Chart history" Billboard 200 for Maroon 5. Retrieved 2013-04-12.